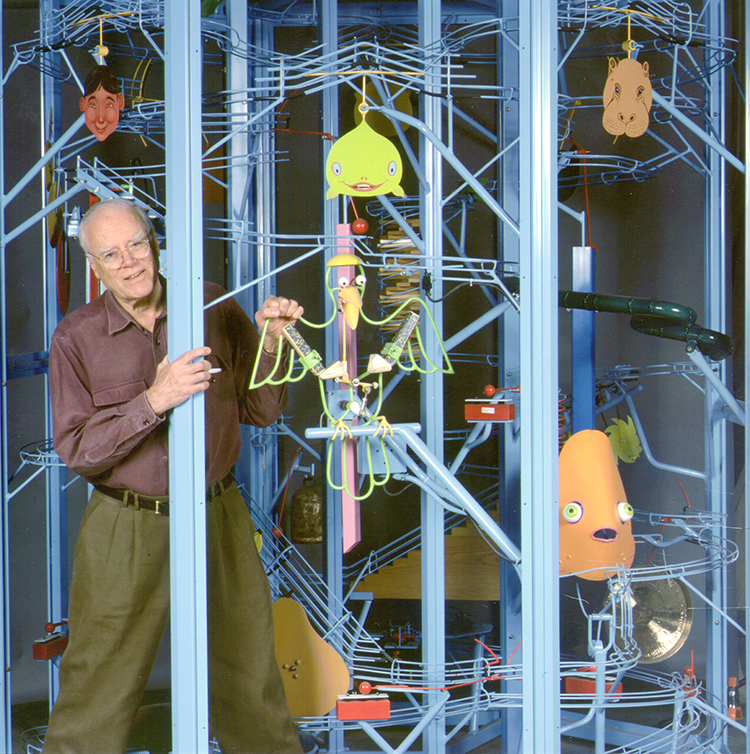 George Rhoads, born 1926, is a painter, origami artist, and sculptor best know for his “audiokinetic” ball machine sculptures that are on display in public spaces around the world, as well as in private collections. Rhoads’ fist solo show was held at the Gallery Huit in Paris and contained mostly watercolor paintings of Paris and surrounding environments. At this exhibit, Rhoads met Origami expert Gershon Legman, who inspired him to start creating folds of his own; most notably, Rhoads created the Blintz Bird Base, which is now a standard for creating an animal with four legs, two ears and a tail out of one piece of paper. After his successes in the Origami community, Rhoads returned to the U.S and to painting, which became increasingly welcomed by art collectors and buyers. Eventually, Rhoads began to feel that he hadn’t learned enough, that he wanted to try new things and enter a different direction than his previous paintings. 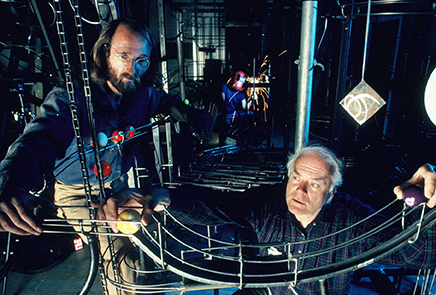 Through this journey, Rhoads began inventing ideas for games and toys. The first toy he sold was the Cliff Hanger and was sold to the Milton Bradley Company. Shortly after, he began experimenting with metal sculptures that moved and made musical sounds. The earliest ones were operated with hand cranks and turned gears that rang bells. “Homage to Ludwig” for example, was activated by a steel ball that played the first notes of Beethoven’s Fifth Symphony as it bounced down xylophone keys. Later Rhoads added motor-driven chains with curved prongs that carried balls to the top of the sculptures and released them to the power of gravity. The first ball machines were single-track, hand-powered devices, small enough to sit on the average coffee table in someone’s living room. (3) Around 1958, Rhoads met Hans Van de Bovenkamp, a Dutch-born artist then living in the West Village, who was involved in sculpting fountains. 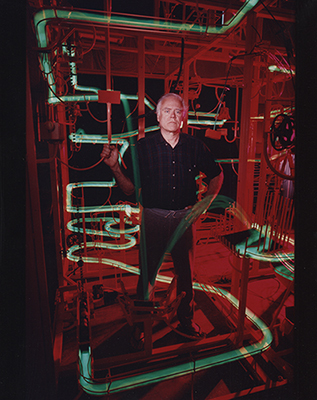 Rhoads began to make his own kinetic fountains, which recycled water through gravity-based systems similar to those he has since used with rolling balls. After appearing on The David Frost Show in 1972, Rhoads was inundated with commissions for his ball machines. To gain more space, he moved to Dundee, NY, where he met Robert McGuire. Rhoads hired McGuire to help construct his sculptures, and so began a working relationship that lasted over thirty years. In 1981, Rhoads was commissioned to build a sculpture named 42nd Street Ballroom for the New York/New Jersey Port Authority Bus Terminal in New York City, which ushered in a period of production for larger, monumental ball machine sculptures. Rhoads’ sculptures can range in size from small wall-mounted pieces to machines that fill entire rooms and span multiple stories. His work has been installed in public spaces and private collections around the world including large pieces in Japan, Guam, Australia, Spain, Israel, Mexico, Chile and Taiwan. Nearly all of his sculptures are still in operation today, and have been noted for their popularity with the public. In particular, the way his work is able to capture the attention and adoration of all ages. From 1989-2007 George Rhoads partnered with Robert McGuire to create his sculptures at Rockstream Studios in Ithaca, NY. In 2007, Creative Machines(located in Tucson, AZ) took over the creation of Rhoads’ sculptures, and continues the tradition of Rhoads’ artwork today. Creative Machines continues to use the techniques developed by George Rhoads in their ball machine sculptures, incorporating fabrication methods, design elements, and strategies for making reliable, long lasting sculptures. © 2019 George Rhoads. All rights reserved.